As a potential future leader, it’s essential that you know how the force is changing. WMP2020 LIVE: the Chief’s Roadshow, presents you with the perfect opportunity to learn more about WMP’s ambitious modernisation programme. We’d strongly recommend that you book onto a WMP2020 LIVE session to discover what lays ahead and discuss the way in which the changes will be implemented so that you’re ready to deliver in your new role. But spaces are strictly limited so early booking is essential to avoid disappointment. 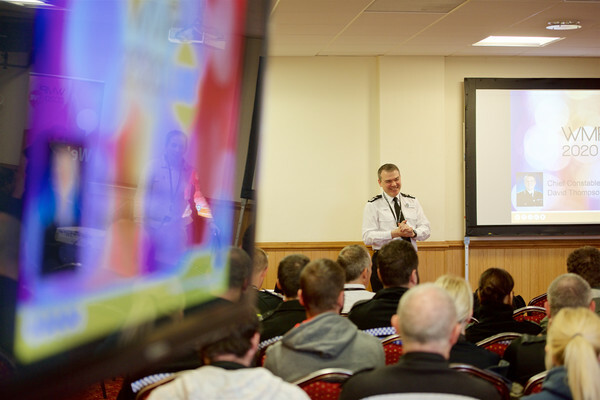 Chief Constable Dave Thompson said: “We developed WMP2020 LIVE from the results of the original Big Staff Survey. You said you wanted to know more about the force’s modernisation programme and you needed to understand what WMP2020 meant to you. “From visitor feedback, it’s clear that we delivered and this year we will once again be bringing you the best of WMP2020 LIVE with some exciting new additions. “I’m always keen to get out and meet people on the job to listen and understand what matters. But with everyone working so hard, getting real quality time with people can be difficult sometimes,” he added. Originally scheduled for July, this year’s event was postponed until October when the high demand levels had reduced. After a conversation with your line manager to ensure there’s cover in your team, choose a date and a venue to suite you then select your two-hour time slot. In the confirmation email you’ll receive, we’ll send you the details of the two seminars for that session. These are optional so if you see something you like and want to sign up to one, just click the link to reserve your spot.